← SUPER! New book with table of readings for the Novus Ordo and TLM! ACTION ITEM! It is nice to have as your Patron the great Baptist, for I get two feasts a year, his Nativity and his Beheading. For the Vigil of St. John (today, as I write) in the old Roman Ritual the priest would once bless bonfires! And in Bavaria, witches are burned! A priest friend who shares my feast sent me a spiffing photo (below – a little hard to see at this size, but I assure you, there is a witch in there). If you have any unwanted witches (and don’t we all? ), send them to Bavaria next year for a nice vacation. In other places, cast-off or unneeded things are burned… in a way parallel, I suppose, to throwing things away at the other end of the year after the Winter Solstice. In any event, the evening is about as long as the year can offer, so a great party could be had well into the night with much cooking in the open and revelry. Have a nice bonfire! Lord God, almighty Father, the light that never fails and the source of all light, sanctify ? this new fire, and grant that after the darkness of this life we may come unsullied to you who are light eternal; through Christ our Lord. All: Amen. At this point the fire is sprinkled with holy water and everyone sings the hymn Ut quaent laxis which is also the Vespers hymn. It is almost as if the fire, and our celebration, is baptized. The reference to light and darkness surely harks to the fact of the Solstice, which was just observed. At this point the days get shorter in the Northern Hemisphere. I looked at that HERE and HERE. For the feast of St. John in June for centuries the Church has sung at Vespers the hymn beginning Ut queant laxis. Those of you who are lovers of the movie The Sound of Music will instantly recognize this hymn as the source of the syllables used in solfège or solmization (the use of syllables instead of letters to denote the degrees of a musical scale). Both the ancient Chinese and Greeks had such a system. 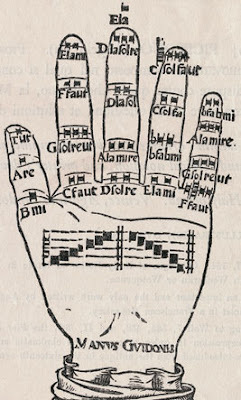 After the medieval period (when music became less modal and more tonal) to complete the octave of the scale the other syllable was introduced (si – taken from S-ancte I-oannes, becomes “ti”) and the awkward ut was replaced sometime in the mid 17th c. with do (or also doh – not to be confused in any way with the Homeric Simpsonic epithet so adored by today’s youth, derived as it is from the 21st century’s new liturgical focal point – TV) and do came to be more or less fixed with C though in some cases do remains movable. It is also good to gather St. John’s Wort (Hypericum perforatum) on the feast. “Wort” is from Old English wyrt (German Würze), which means “plant”, but is used mostly in compounds. Since ancient times “singent’s wort” was known to relieve melancholy or depression, as does borage… which every garden should have. It would be hung above doors, windows and sacred images (hence the hyper-icum “above image”) to keep witches and evil spirit away. Burning those witches might have something to do with its effectiveness as well, now that I think about it. Build a fire tonight, even if you can’t burn a witch, and sing something in honor of St. John! Oh! And eat some snails. It is a Roman custom to eat snails on the Feast of John the Baptist. This entry was posted in PODCAzT, Saints: Stories & Symbols and tagged Guido d'Arezzo, snails, solfege, St. John the Baptist, Ut queant laxis, witches. Bookmark the permalink. Joyous Feast! Hail to good Saint John! Let us pray hard, and then party on! Let the best Belgian Beer in large tankards flow! let the devil be brought to nuthin’! Let us bellow till our voices be hoarsy! gentlemen, scholars…and not bad judges of good whiskey! May St. John defend them, loaded for bear! Let us head to the party on the magic bus! 1. SOLEMNITY of The Nativity of Saint John the Baptist, meaning: NO MANDITORY PENANCE TOMORROW!!! Spread the word. Where I come from it’s traditional to “baptize” people like St. John the Baptist by throwing water at them. Some schools have to call the day off because of this. I hope to get to Mass dry tomorrow! We are having quite the party tonight, but no bonfire. The landlady poo-pooed that. I recall reading (I think it was on Fish Eaters) that worn out sacramentals can be properly disposed of in the St John’s Eve bonfire. Fr Z, one day you will have to organise a trip to Portugal and celebrate your Saint’s Day in Porto. Thanks, Father Z—that St Augustine sermon is so great—as is your voice of it 1600 years later. I spent an hour and a half at Vespers/Divine Liturgy at my canonical parish, celebrating its Patronal Feast day. Friends who are interested in the liturgy joined me.